It wasn’t anything spectacular at the time. When the show first aired on Feb. 19, 1968, it seemed to be a typical children’s educational program. On a black-and-white screen, a tall, dark-haired man nearing 40 years of age wandered into a staged living room, softly singing a song as he changed from a blazer into a much softer, cozy cardigan. That man, Fred Rogers of Mister Rogers’ Neighborhood, quickly rose into recognition and a half-century later is still an American icon. “He’s more relevant than ever right now,” says Amy Franzini, chair of communication studies at Widener University in Pennsylvania. In the more than 30 years that Rogers’ show ran, he won the hearts of generations of Americans as, one after another, they watched, grew alongside and eventually outgrew the program. The show officially came to an end in August 2001. Rogers died less than two years later, after battling stomach cancer. After last year’s bombing at an Ariana Grande concert in Manchester, England, the same quote began circulating on social media. It also resonated after last week’s shooting at Marjory Stoneman Douglas High School in Parkland, Fla. In recent years, people have also shared stories about the encounters they had with Rogers. One fan remembers being comforted by him outside of an elevator after the death of his grandfather. Another was visited by him after undergoing brain surgery. Story after story emerged about Mister Rogers appearing to comfort his “neighbors” when they needed it most. “I grew up with Mister Rogers in the 1980s,” says Matt Pelc of Detroit, who used to watch the show with his cousin, Katie. “We would root for him to put on the red sweater at the beginning of the show because it was our favorite color. “Katie passed away from cancer eight years ago, but those memories of childhood will never go away … She worked almost to her last days helping out students and teachers, something Mister Rogers would no doubt be proud of,” Pelc says. Mister Rogers’ Neighborhood is celebrating a landmark 50-year anniversary in 2018. But Rogers has steadily received attention since his death 15 years ago. Back in 1968, soon after its first episode, the program catapulted Rogers into the national spotlight, and he became a household name. Several years later people drew comparisons between Rogers and Bob Ross of The Joy of Painting when that program made its debut on PBS in 1983. Also in the ’80s, Rogers was famously parodied by Eddie Murphy in the recurring Saturday Night Live sketch Mister Robinson’s Neighborhood; Murphy adopted Rogers’ signature sense of fashion and reserved, jovial demeanor — but little else — in his portrayal of the character Mister Robinson. PBS has tried to maintain Rogers’ legacy through the spinoff series Daniel Tiger’s Neighborhood, an animated program centering on a tiger cub whose namesake is a puppet that made frequent appearances on Rogers’ show. A blog studied Rogers’ extensive collection of cardigans to see whether there was any pattern with the rainbow of fabrics (many of which were knitted by his mother). 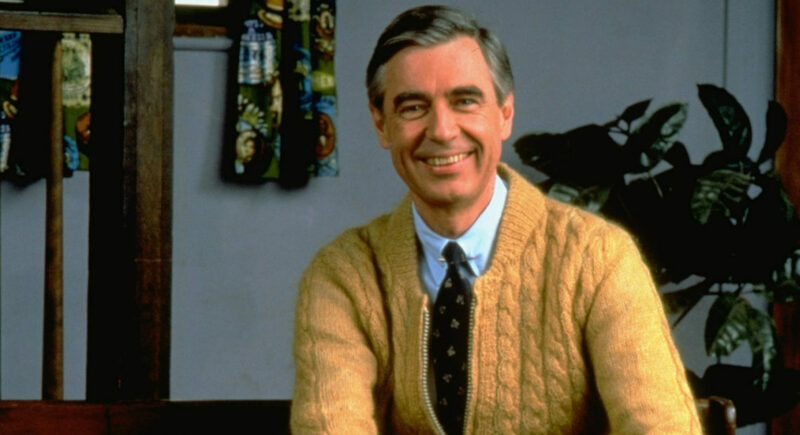 All of these are in addition to the 2004 documentary Fred Rogers: America’s Favorite Neighbor and an exhibition at the Smithsonian National Museum of American History, where one of his signature cardigans is on display. Experts say all this continued attention to Rogers could be due in part to his appeal; the program featuring a gentle man that spoke softly and slowly for children captivated viewers far outside of its target demographic. “(The program) seemed to exude a certain mood, this certain spirit wherever it was playing,” says Robert Thompson, the director of the Bleier Center for Television and Popular Culture at Syracuse University. “Even though it was aimed at kids, it affected anybody else that was within hearing distance of that extraordinary voice and the extraordinary things he said. The show’s content may have been ordinary, but the timing wasn’t. The emergence of Fred Rogers as a television host seemed counterintuitive; Mister Rogers’ Neighborhood debuted a month after the Vietnam War’s Tet Offensive began. It ran reliably every weekday through the rest of that year; through the My Lai Massacre that March and the assassinations of Martin Luther King Jr. and Robert Kennedy in April and June, respectively. And the program continued to run for nearly 33 years (during a 1976-79 hiatus, only reruns and a Christmas special aired). Americans’ fascination with Rogers seems not only to be with what he did. They are equally enamored with how he did it, Thompson says. Rogers’ gentle but honest approach to presenting hard topics was — in its time — a groundbreaking way to engage with children. Bob Latchaw of Colorado was 10 years old when the first episode of Mister Rogers’ Neighborhood aired and says he wasn’t initially interested in the program. But after the birth of his children, he began to appreciate it.